More sketches for the look of Ciceron. 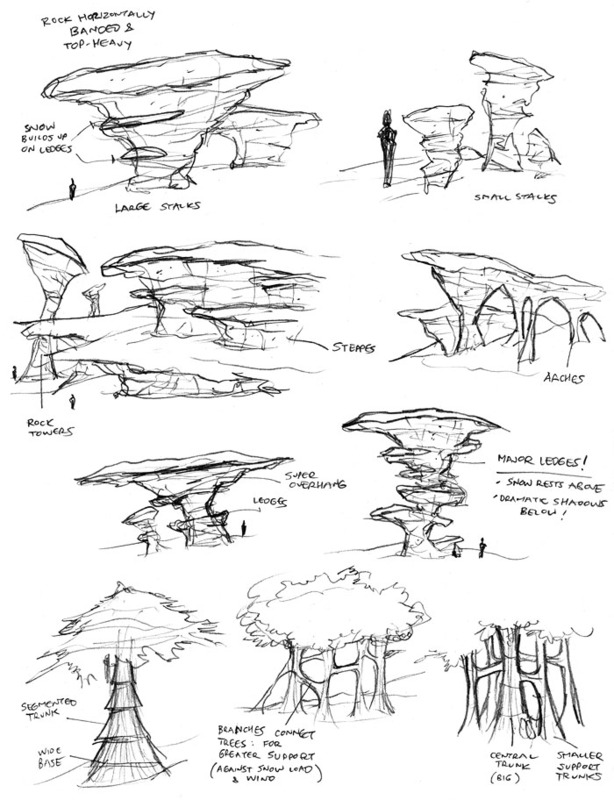 I really liked the look of the top-heavy mushroom-shaped rock formations, since they seemed very weird and alien to me. Now that I think about it, I never really drew any of the larger free-standing formations. Mostly the rock formations in the story are all of the bigger, mountainous variety. Bummer. Some free standing ones would have been cool to see. 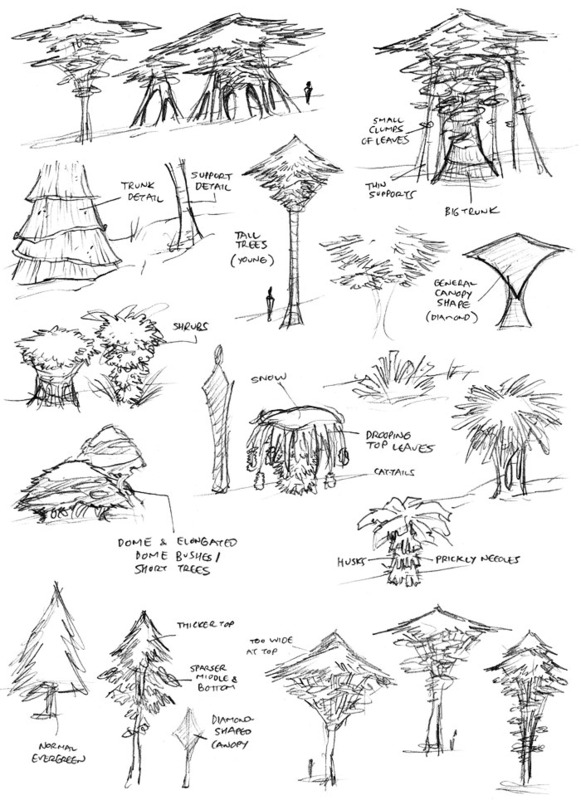 I also did some sketches here for the Ciceron trees. I thought it would be interesting to have trees that develop supporting structures, given the snow loads they have to carry. But early on, I realized that it would be a real bear to try to draw those kinds of trees, especially in the foreground, since they would end up blocking too much of what’s behind them due to their oversized footprints. After ditching the idea of the multi-trunk trees, I tried to at least make some free-standing trees that looked a bit different and alien. I do like the diamond-shaped designs at the bottom, with the dense top canopies and sparser branches below that form the bottom halves of the diamonds. In the final art, I don’t think I ever really followed through and showed much of the trees. On this page, I also did some other types of shrubs and growth on Ciceron, not that many of those made it into the final artwork either. 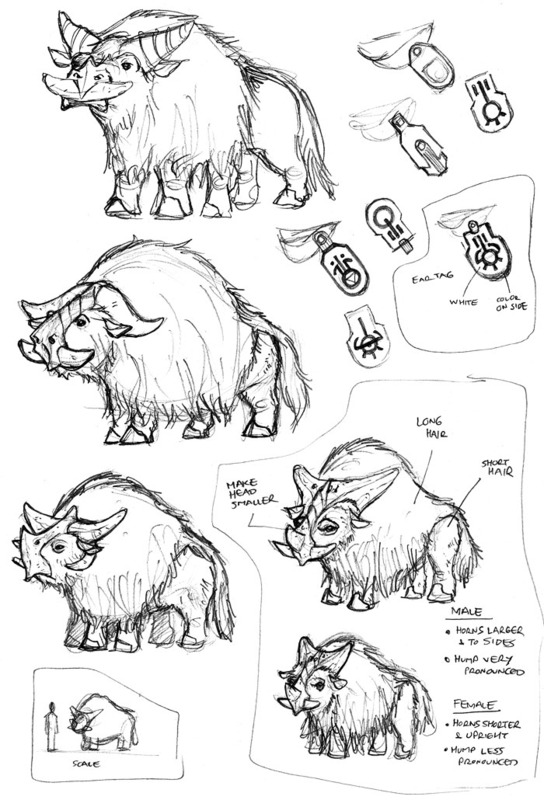 The Ciceron yak were pretty fun to design since every sketch had something going for it. It’s pretty rare that I like something about every concept and then just have the luxury of picking the one I like the most. More often it’s, “Ugh, ugh, horrible, okay, ugh, that’s it!” The main thing with the yak was settling on something that looked big and bulky without looking too aggressive. Some of the designs ended up looking a bit more domesticated than others, so those are the ones I went with. 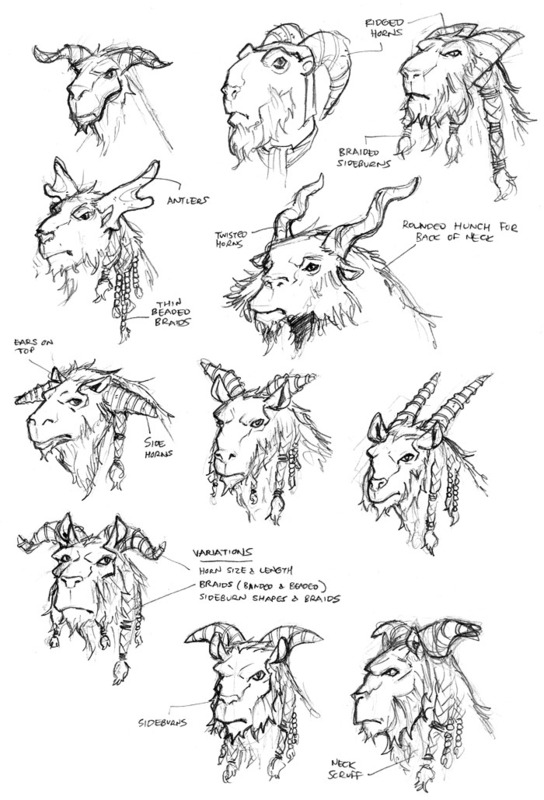 Once I had the general look of the Ciceron Yak down, I spent a little time refining it, especially the head. Again, I pretty much liked all of the designs to some degree, so it all just came down to which one I liked best. 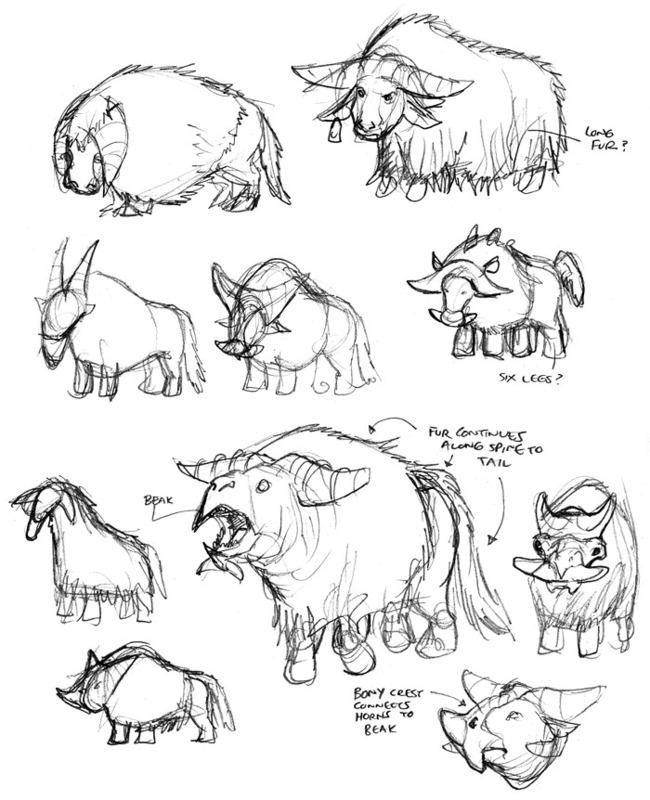 Interestingly, in these sketches and in some of the earlier pages of the actual story art, the yak always looked a bit weird to me. I couldn’t quite put my finger on it, but they were just off somehow. And then I realized it…necks! I had been drawing them without necks! Once I figured that out, they started to look much better to me, but in the early pages, you can still see them looking weird. I knew I wanted the Ulon Dosi to have a goat-like appearance, so that made for an easy starting point. In general, with aliens, I don’t mind drawing inspiration from actual animals, but I’m not a big fan of just putting straight-up animal heads on human bodies. I prefer to play around with features, mixing and matching them between different animals (or making them up), and I always try to play around with different proportions. The Ulon Dosi had the extra challenge in that I knew they were going to be major characters in the story arc and needed to be sympathetic and look like intelligent beings, so I didn’t want them to look TOO animalistic. So I deliberately kept the snouts from being too long and tried to straddle that line between animal and human proportions in the face. As a random note, back in 2007, I did a freelance comic project called The House of IL for a corporate anniversary event. The 3-issue comic was distributed among the company employees but was not made available to the masses. It was a fun D&D-type story about a band of adventurers and I really liked the different character designs I did for that series since the characters all had armor based on different historical styles, and each set of armor was distinctive and had its own telltale, instantly recognizable features. Anyway, one of the characters had tiny beads in his hair, and I always liked that look, so those beads made it into the Ulon Dosi as war beads that the fighting males of the village wear. You can check out some pages from The House of IL, as well as the character sheets here. If, for some reason, you’d like to buy a set of the comics, just shoot me an email through my Contact page.